Top Removals are famous throughout London and the surrounding areas for our Man and Van service. No matter your requirement, you can rest assured our dedicated and professional team are the first choice for business and domestic removal services. All of our work is undertaken to the highest of standards and all staff is specially trained. As accredited members of the National Guild of Removers and Storers scheme, we know best how to safely, securely and efficiently move your items on time and within budget. We take the utmost care of your possessions regardless of value as we understand every item is precious. 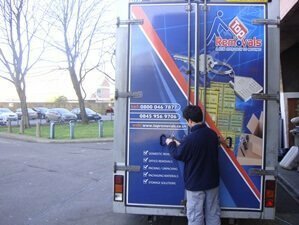 Why Should You Trust Our Man and Van Service in London? Our industry experience has been successfully garnered across a vast array of different man and van projects and our meticulous attention to detail ensures our satisfied customers always return to us. Our professionalism is truly unrivaled and our fleet of staff are trained to exact the high standards of service we are famous for, no matter the job. We continually strive to achieve 100% customer satisfaction with our London Man and Van service. Please give us a call or get in touch if you wish to discuss any project. Our professional and dedicated team will be delighted to assist with your enquiry. Alternatively, you can use our ‘book a service’ form and we will get in touch.